Dell Inspiron N5110 not supporting Windows 10? I will try one more time to make this post cause the previous one never went live. I have a 3 years old Dell Inspiron N5110 i5/8GB ram/Nvidia/ Win 7 home premium and i am very happy with its performance and build quality. Yesterday i tried to reserve a Windows 10 copy and after having trouble to make the icon pop in my taskbar, i managed to get it popped. Is it me or other N5110 users getting this message? Is there any other BIOS update that i might missing to get his to work? Is Dell going to fix this till 29 July and when Windows 10 go live? An official reply or if there is an official link from Dell for this issue would be appreciated. RE: Dell Inspiron N5110 not supporting Windows 10? The N5110 and similar Wistron-built systems like the N4110 never received 8.1 support -- so it's highly unlikely they'll ever see an update for Windows 10 support. How is this possible? A 3 years old machine will not get support for windows 10 while older and lower specs machine are qualified??? Is there an official Dell reply somewhere? Are these forums monitored by Dell or just from community members? Microsoft made changes to Windows 8.1 (continuing to 10) that rendered some CPUs and older BIOSes incompatible with 8.1, where they were compatible with 8. If you extrapolate forward, since Dell isn't supporting 8.1 on the N5110 (and other contemporary systems), 10 won't have support either. 1. Computer hardware is designed and built by contractors - not by the company whose name is on the outside. These contractors can disappear -- or be taken over by others. It may not be possible for the original contractor to produce a new BIOS. 2. The incompatibility may be hardware-based -- the N5110 doesn't have UEFI support, and it may be impossible to add it. 3. There may be no funds to test the system for compatibility. Essentially, Apple is leading the way - once a Mac system reaches three years old, Apple essentially abandons it. The PC manufacturers are simply following the leader. This document is a fact regarding Win 8/8.1 but there is nothing OFFICIAL regarding Win10. Also i cant find which is EXACTLY the incompatibility of the BIOS... Is it the UEFI support? is it software and not hardware? is it just an update that Dell could release? Im on the same machine and facing the same issue. I guess no Windows 10 for us. That <profane>! It is not the lack of UEFI support -- though that lack does lock out some features of 8/10 by default. 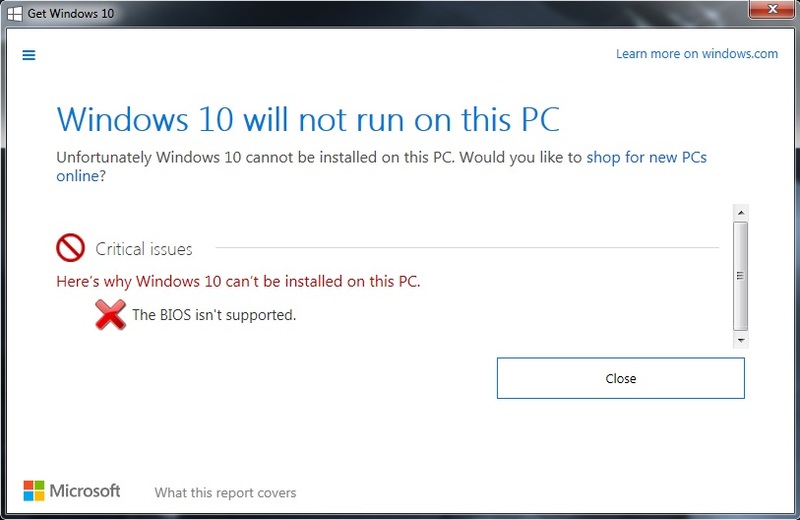 Windows 10 will run either as legacy BIOS or UEFI, as Windows 8 does. Though Dell doesn't support 8.1 on the N5110, there are reports of people running it. The same may happen with Windows 10 -- but Dell won't guarantee it. I don't know of any notebook manufacturer - not the mainstream ones -- that will support systems that are more than three years old (and the N5110 was released over four years ago, so it was designed in the 4.5-5 year ago range). All electronic hardware comes to an end support-wise -- in other words, has a life cycle. For cell phones, it's about 18 months; for notebooks, about three years. As for the mainstream manufacturers you said i know and i own 2 more laptops older than my N5110 that are already qualified and both having lower specs. Dont want to mention the manufacturer for obvious reasons but its the first that pops in your mind. Also N5110 might released on 2011 but some customers bought it after 1 or 2 years after release. Are these forums monitored and running from Dell's personnel or from customer community members? An official reply from Dell to the mentioned issue would be greatly appreciated cause i have to give an official answer to my people. Just update your BIOS to A11, wait for some time (few hours or a day), and everything will be Ok. It works although not supported by Dell. I don't know what in particular is different about that system as we have got far older hardware to Windows 10.